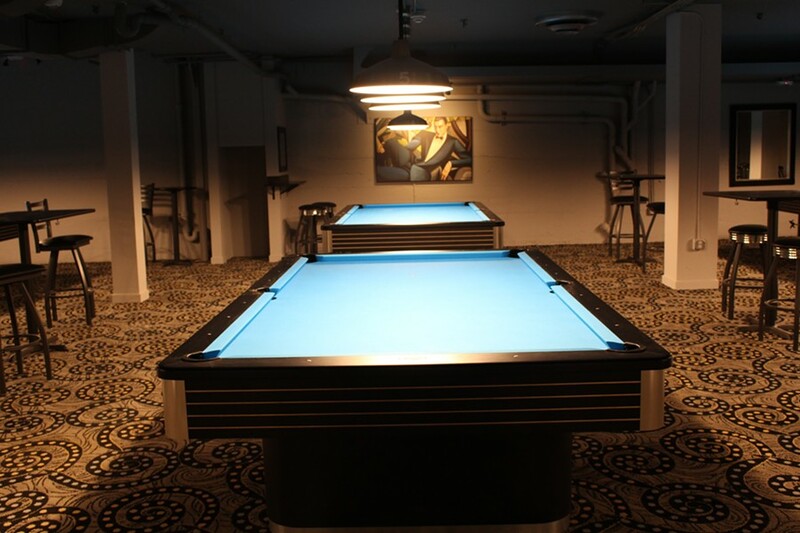 Draw Billiard Club's pool hall is literally underground. It’s been a slow couple of years for Jason Kung and Paul Revenaugh. The pair have been working on their dream bar/restaurant/pool hall since 2015, but given the venue’s setting — in the basement of a historic building in downtown Berkeley — permitting hasn’t been easy. But the end is in sight: Draw Billiard Club (64 Shattuck Square) is set to open next month, according to Kung. The space looks nearly finished, with a classic-looking bar and open kitchen taking over what used to be Morgan’s Cafe on the first floor. The main attraction sits underground: 15 retro pool tables spread across 8,000 square feet. With its basement setting, Draw Billiard Club is meant to have a speakeasy vibe, with 1920s decor to match. While the art deco influence is clearly present, it’s not overdone or cheesy. The place also offers plenty of quiet nooks and cozy seating areas for those looking to grab a bite or drink without a round of pool. Another notable choice is the near-lack of televisions. The upstairs and downstairs bar areas each have one small screen. “We’re not a sports bar, but we love the Warriors,” Kung said, laughing. In addition to a full bar, Draw will serve a small food menu focusing on individual-sized, Chicago-style, deep-dish pizzas. There’s no executive chef yet, but the pizza recipe comes from Revenaugh. Local businesses such as Emeryville’s McLaughlin Coffee Company and Alameda Point Craft Soda will also be represented. Kung wouldn’t elaborate on price point — for the food or pool — but says it’ll be in line with competition in the area. Kung and Revenaugh have both lived in the East Bay for ages. They opened another pool hall, Broken Rack Billiards, in Emeryville in the ‘90s, and Revenaugh went on to open The Sunny Side Cafe in Berkeley. After stepping away from those businesses, they reunited for this project. Draw Billiard Club will be open from 11 a.m. to 2 a.m. next month. 64 Shattuck Square, DrawBilliardClub.com.